Dark Futures: Does Humanity Really Need a Backup Earth? If things went south on Earth, could Mars or an exoplanet be Earth 2.0? SpaceX CEO Elon Musk has a vision: He wants to get humans to Mars as soon as possible. He already wowed the world this year, when the Falcon Heavy launched and flung a Tesla car toward the asteroid belt. And this heavy-lift rocket will be dwarfed by the boosters Musk plans for Mars exploration, which he says will carry colonists in fleets of ships to the Red Planet. While getting to Mars is an end in itself, there's another compelling reason to go. Science fiction is full of dystopian futures for Earth if humanity remains limited to this planet. There are the asteroid strikes of the "Deep Impact" and "Armageddon" films, the robot wars of the "Battlestar Galactica" TV series and "Terminator" film franchise, the medical problems and overpopulation in the "Children of Men" and "Elysium" movies, and many other disasters natural and artificial. Dark futures and colonizing other planets will be covered in "AMC Visionaries: James Cameron's Story of Science Fiction," which runs its fourth episode tonight (May 21). And a quick glance around the solar system shows us one real-life reason scientists — and indeed, all of us — should take a page from science fiction and be concerned about Earth's future. The moon, Mars and many of the "airless" moons around the neighborhood are littered with craters. These came from space rocks and other small worlds that slammed into the moon's and planet's surfaces over billions of years. Lest you imagine that Earth is immune because of its thick atmosphere, think of the dinosaurs, felled about 66 million years ago when a large asteroid or comet around 10 to 15 kilometers (6.2 to 9.3 miles) in diameter slammed into the Earth. We also just passed the five-year anniversary of Chelyabinsk, when a 17-meter (56 feet) small body exploded over a town in Russia, causing many injuries and property damage from shattered glass. NASA does have an active asteroid-search program and some plans for dealing with asteroids menacing Earth, but even preparing for those intruders isn't enough; there's another, bigger inevitable threat to our planet. In about 4 billion years or 5 billion years, the sun will swell into a red giant after it consumes all of its hydrogen and begins fusing helium. As the star expands, it will swallow up Mercury and Venus and get close to Earth. Our planet will be roasted to a crisp, thrown out of its orbit or swallowed altogether. In any of these scenarios, that's bad news for humans and life on Earth in general. Legendary director James Cameron talks the dark futures of science fiction with director Christopher Nolan in the fourth episode of AMC Visionaries: James Cameron's Story of Science Fiction, which airs May 21, 2019. Robert Zubrin, founder of the human exploration advocacy group The Mars Society, told Space.com that Mars will someday be an inhabited planet as science fiction writers envisioned. As only two examples of many showing that future, there's the 2015 Matt Damon movie "The Martian" or the 1990 Arnold Schwarzenegger film "Total Recall," which included the famous line, "Get your a— to Mars." But why does science fiction make exploration look so much easier than we find in real life? Zubrin said, in part, it's because of our mindset. "Here we are, 500 years or so after [Nicolaus] Copernicus [who said Earth orbits the sun], and most people still talk about the Earth as the world, and there's a thing above us called the sky. Most people still have this geocentric viewpoint," Zubrin told Space.com, pointing out that Earth is in space and we rarely think about that fact in our everyday lives. Zubrin said our approach of going to Mars via low Earth orbit and the moon is incremental. This approach to space exploration, he said, is similar to telling Lewis and Clark to just go 100 miles (160 kilometers) out beyond the Mississippi River and to wait for the next group of explorers to move farther west. "If someone asks you why space is so important, it's comparative to somebody in a small village somewhere saying, 'Why is the rest of the world important?' which is sort of an absurd question," Zubrin said. So, he advocates going elsewhere in search of resources, knowledge or a safe haven that we couldn't find on Earth. Interstellar travel would be the ultimate dream, Zubrin said, but in the meantime, we should focus on what we have at hand: Mars, which is close enough to visit using today's technology. "The most important step is deciding that you want to do it. This is really the dramatic step that Elon Musk is taking," Zubrin said. "There are people at NASA who want to do it, but as an institution, it has been dragging its feet and providing every excuse to the political class not to embrace the challenge." Moving to Mars — or beyond? Zubrin's plan (which he outlined in a 1991 paper called "Mars Direct," and which he has expanded on greatly since then) advocates for a direct flight to Mars, with minimal or no on-orbit assembly of the spacecraft. Using current propulsion systems, a spacecraft could get to the Red Planet in six months — the standard rotation astronauts spend on the International Space Station, Zubrin pointed out. The first missions would bring most of the supplies those travelers would need to live, such as food and water. But the early trips could also bring along architecture so later missions could do more "living off the land," such as greenhouses or habitats. (The first Mars voyagers may eat more meat brought with them, while future generations would be more vegetarian due to the resources on hand, Zubrin said.) He said the habitats of the Mars Society's Mars Desert Research Station and Flashline Mars Arctic Research Station are designed to preview what real Red Planet homes could look like. The return vehicle would include propellant made from Martian carbon dioxide and water, specifically to generate the fuels methane and oxygen. Zubrin said it's the cheapest propellant combination, with only a hydrogen-oxygen mix providing better exhaust velocity. But there's a big problem with Mars — it's not very much like Earth. Sure, people could conceivable live on it with technology to manage the risks. Its day is similar in length to Earth's day, too. But the planet has only one-third of Earth's gravity. Martian air isn't breathable. Water, if it exists at all on the surface, would be in scarce quantities. Conditions are even worse on the moon, which has one-sixth Earth's gravity, a longer day-night cycle than our home planet and no air whatsoever. "They're not places that we are necessarily going to colonize in large numbers," Roger Launius, a retired curator from the Smithsonian Institution's National Air and Space Museum, told Space.com. He predicted that by the end of the century, there may be research stations at the moon or Mars, similar to what exists now in Antarctica. But to really find another home for humanity, we'll have to follow the lead of "Battlestar Galactica" and search for another Earth. Because, otherwise, children are going to be born in lunar or Martian environments that have a lesser gravity than Earth. How this will affect their development when humans are built for Earth is an unknown, Launius said. 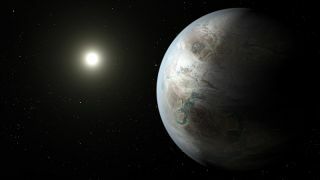 But quickly getting to other stars, where second Earths may exist, will be slow unless we figure out a method for faster-than-light speed, or a way to sustain a spacecraft over multiple generations, Launius said. Another possibility is to extend astronaut life spans through hibernation (as done in the movies "Alien" and "Avatar") or by becoming a sort of "Star Trek"-like Borg that would integrate robotics into the human body to extend lives. This story was inspired by Episode 4 of "AMC Visionaries: James Cameron's Story of Science Fiction," which airs tonight at 10 p.m. EDT/PDT (9 p.m. CDT). A companion book is available on Amazon.com. Follow us @Spacedotcom, Facebook and Google+. Original article on Space.com.